BLACKSBURG, Va., April 6, 2009 – Jennifer Lamb, a dual degree honors student at Virginia Tech, has been named a 2009 Truman Scholar, receiving a $30,000 scholarship for graduate study. The Truman Scholarship recognizes college juniors with exceptional leadership potential who are committed to careers in public service. Scholars are selected on the basis of leadership potential, intellectual ability, and likelihood of “making a difference.” Only the third Truman Scholar ever from Virginia Tech, Lamb is one of 60 students from 55 U.S. colleges and universities chosen this year. Lamb is majoring in political science in the College of Liberal Arts and Human Sciences, and in agricultural and applied economics in the College of Agriculture and Life Sciences. The Boulder, Colo., native also has a minor in history. In her second year, Lamb held three internship positions in Washington D.C. During the summer of 2007, she was an Economics and Outreach Intern for the Atlantic States Marine Fisheries Commission. 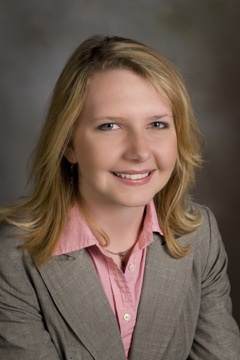 In the fall 2007 semester, she interned with the House of Representatives Committee on Agriculture. A research assistant in the Office of International Research, Education, and Development, Lamb will work in western Kenya this summer on a project researching soy consumption, nutrition, and HIV/AIDS. This experience is supported by the Austin Michelle Cloyd University Honors Scholarship for Social Justice. Lamb hopes to earn a Ph.D. in resource economics and a law degree with a concentration in environmental law. In her career, Lamb plans to work in public service addressing international and local dimensions of rural poverty and agricultural sustainability. An avid horsewoman, Lamb is also captain of Virginia Tech’s Western Team and a member of the horse judging team. On this Virginia Tech Student Profile video, Lamb discusses how her interest in public policy stems from her love of horses. This past December Lamb co-authored a paper with professor Leon Geyer, of agricultural and applied economics, and Andrew Rogers entitled “Adding Biofuels to the Fire: A Sustainability Perspective on Energy Policy in the 2008 Food, Conservation, and Energy Act of 2008” in the publication Sustainable Development Law and Policy Review. The 2009 Truman Scholars were selected from 601 candidates nominated by 289 colleges and universities. Finalists in three- to four-state regions were interviewed by panels that typically included a university president, a federal judge, a distinguished public servant, and a past Truman winner. Scholars receive leadership training, career and graduate school counseling, and internship opportunities within the federal government. Recipients must be U.S. citizens with outstanding leadership potential and communication skills, and have a commitment to careers in government or the not-for-profit sector. Virginia Tech’s two previous Truman Scholars were Michael Gerusa in 2002 and Phallisha Newsome-Horton also in 1992.